You have traditional magnetic platters, still the work horses of mass storage. They’re reliable and cheap; a 500 GB HDD that will last five years can be had for less than $50, and 1 Terabyte – 1,000 GB, space unheard of on desktops just a few years ago – are going for $100 or less. The minimum spin speed is 5400 rpm; 7200 rpm costs very little more; and some HDDs spin at 10,000 or 12,000 rpm. Faster is better, of course. Then there are Solid State Drives (SSD), essentially enormous flash memory arrays like a USB thumb drive on steroids. With no moving parts they really make data fly; Windows will boot up in 30 seconds, and video editing proceeds as fast as Word document editing. SSDs are available for less than $100 in capacities up to 120 GB. A one TB SSD will still run you over $600. In between are hybrid drives, part SSD and part HDD, integrated to optimize overall read/write speed and access. Essentially, you get a HDD with a very large cache. Frequently used files are kept on the SSD, while less frequently used files go the HDD. Prices are closer to inexpensive HDDs than to pricey SSDs. While faster is always better, bigger is not. In fact, bigger can be the enemy of faster; excessively large drives tend to come in slower spin speeds. Data can be scattered all over a nearly empty disk, necessitating frequent optimization. Before you rush out to buy a 1 or 2 TB drive of any kind, ask yourself how much of that capacity you are really going to use. I have a laptop that came with 500 GB of storage; in two years, I’ve yet to fill half of it. Finally, what should you do with the old drive? I don't recommend selling or giving away your old hard drive. Even if you delete everything and reformat it, the drive still contains recoverable data that you may not wish anyone else to access. 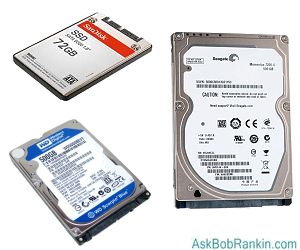 My articles Completely Erase a Hard Drive and How to Destroy a Hard Drive will give you some practical options to destroy the data on the drive, or render it useless. Most recent comments on "HOWTO: Upgrade or Replace Your Hard Drive"
Clone your HD, and keep the spare one in a safe place as a backup. In case of trouble, you can get going again in about 5 minutes without having to worry about recovery or how you're going to re-install the OS or find your licence keys for all that software. I've been using open-source ReDo backup & recovery to clone both my Linux and Windows machines to 1TB USB external drives. It's a whole lot easier than Clonezilla. It restored my Windows7 box exactly as before. I use it on both HDD & SSD drives. Could you please recommend the $20 kit that you refer to, for connecting a new (soon-to-be-internal) drive EXTERNALLY via USB? Thanks. EDITOR'S NOTE: Here's something even better. A USB to SATA Adapter, that includes cloning and backup software for PC & Mac. For Windows 7 I've converted the HD to an SSD easily in two older laptops by just using the built-in Win 7 Backup and Recovery program. Just make an image to an external HD and then restore it to the new empty drive you install using the Rescue Disk that Win 7 also suggests that you make with the backup. Seamless! Latest was today on a Crucial 240GB SSD on sale this week for $113. Secondly, I've kept the old mechanical drive as a backup to reinstall in case the new HD goes bad in the future. I have found a good two pound hammer works very well to fix a old worn out hard drive. Bob, Another interesting article. You sure do a great job. I wonder if you could explain the price difference between HDD's and SSD's. It seems to me that an HDD with all the moving parts would be more expensive to manufacture than an SSD. HAPPY BIRTHDAY Bob. Hope you have a great day. Thanks for all the great advice and use of a great website. The USB to SATA Adapter seems to be only for 2.5 drives. 3.5 drives would need an additional 12v power source. Just want to have a fresh OS and start over. Thanks!